Drugged driving has become a major concern for law enforcement, especially in light of the new medical marijuana law passed in Massachusetts in the November 2012 election. Drugged driving may be just as dangerous as drunk driving and some studies suggest that drugged driving may already be more common than drunk driving. Compounding the problem is the fact that there are no clear tests for when a person is too high to drive, so people may be more likely to get behind the wheel after smoking marijuana or indulging in other drug use. Our Boston drunk driving accident lawyers are concerned that the legalization of marijuana will add to the number of drugged drivers on the road, increasing the accident risk. This means more innocent victims could be harmed as a result of drivers who are too impaired to drive safely. Recently, the California Office of Traffic Safety conducted a study of more than 1,300 drivers. These drivers, who lived in various cities throughout California, were voluntarily tested anonymously over the course of several weekends. The testing revealed that approximately 7 percent of the studied drivers tested positive for alcohol while 14 percent tested positive for having drugs in their system. In other words, there were twice as many drivers who were potentially impaired by drugs as there were drivers impaired by alcohol. When a driver is on drugs, his reflexes can be slowed and he may be unable to focus or pay attention. The amount of brain activity that is devoted to driving can be significantly reduced. Marijuana, while classified as neither a depressant nor a stimulant, can make drivers feel calm and laid back and can reduce their ability to respond to driving situations. This makes an accident more likely, which is why impaired driving laws or OUI laws in Massachusetts forbid not only driving under the influence of alcohol but also driving while on drugs. Unfortunately, there is no clear test to determine exactly when a driver is too high to drive. With alcohol, it is clear that a driver who has a BAC of .08 or higher is too impaired to be behind the wheel. Most people are aware that it takes only a few drinks to get to this level and many are discouraged from drunk driving because they know of the dangers and of the legal risks they take when driving with a high BAC. 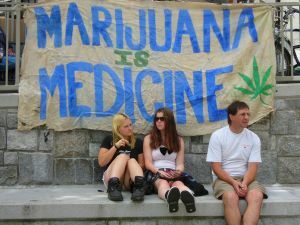 With marijuana, however, it is difficult to determine when a person has too much of the drug in their system. Complicating matters further is the fact that THC, the active drug ingredient in marijuana, can stay in the body for days or weeks after a person has taken the drug- so a person testing positive for marijuana in his or her blood may not even be high at the time he or she is driving. The confusion surrounding drugged driving is likely to only become worse now that Massachusetts approved a ballot legalizing medical marijuana. Since the drug is now legal for medicinal use, having small amounts of THC in the body might not be automatically be considered against the law- and thus it becomes unclear how to treat a driver pulled over with a bit of THC in his system. The high number of people who drive while impaired by drugs, coupled with the difficulty of enforcing drugged driving laws and the new legalization of medical marijuana all present major risks to drivers. The bottom line is, if a drugged driver causes an auto accident, serious injury could result to innocent victims.